Never in a million years did I think that touching a bag of fresh pasta would magically transport me to Italy only two months later. Are you ready for this story?! One summer night, I found myself in the kitchen cooking a big pasta dinner for my family. We were up in Lake Placid on our annual summer vacation. It’s always a very lively trip; my cousins and their kids come along with extended family and their friends. It’s like “My Big Fat Italian Wedding” except no one is getting married (or eating lamb). On the menu was fresh tagliatelle with a simple tomato sauce. 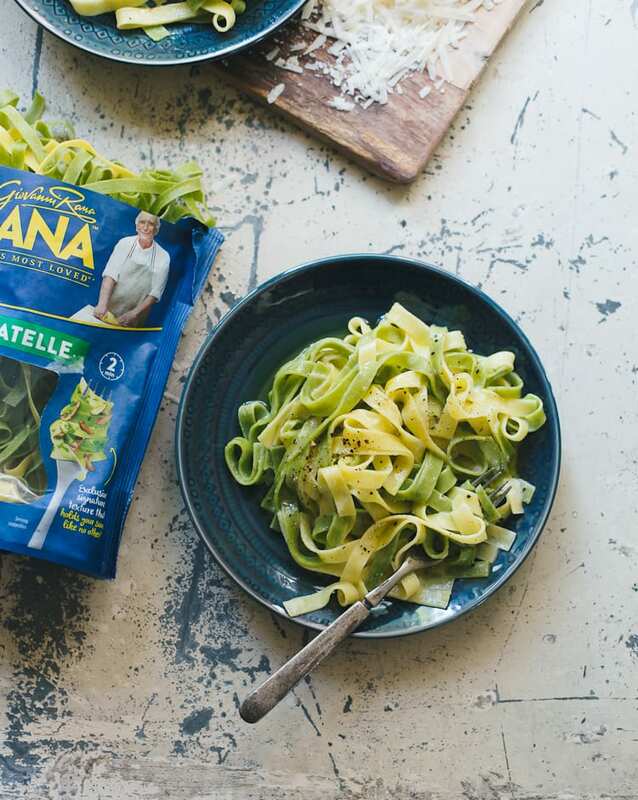 Right before adding the pasta into the pot I looked at the bag (the brand was Giovanni Rana- remember that name!) and thought to myself, I hope this is going to be good! What I didn’t realize however, was that things were about to get really good. The next day, at exactly 3:24 PM I received an email. Well, not the actual pasta man himself; it was from one of their brand reps looking to connect. The email was also an invitation to ITALY! They invited me for a 3-day trip of a lifetime to completely immerse myself in the city of Verona, the birthplace of the Rana pasta brand. And that is how my serendipitous adventure began. The minute I stepped off the plane into the Rome airport, I was so tired I didn’t even know what day it was. My eyes were so dry and scratchy they felt like sandpaper. I was thinking about coffee and what kind of food they had at the airport. Two espressos and one lukewarm cappuccino later (served with a tiny, individually wrapped square of dark chocolate!) I was little miss chatter box ready to rock and roll! I get along famously with caffeine. 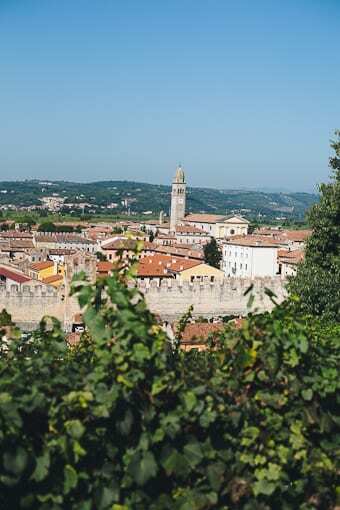 I jumped on a quick connecting flight to Verona. Once I arrived at my hotel, I had a few hours to myself to explore the city. 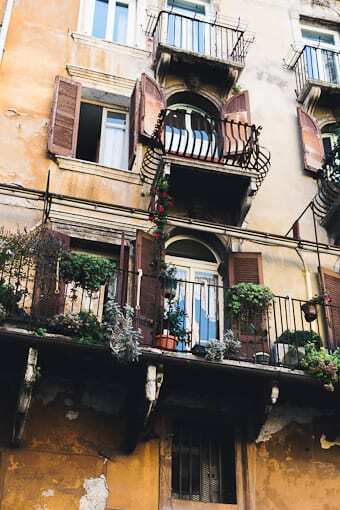 The scenery was exactly as I imagined: beautiful terracotta buildings, balconies with gorgeous hanging flowers, couples making out under fountains, gelaterias on every corner- I was in heaven. I could’ve have spent one whole day just walking around taking pictures… and eating, obviously. The next day we visited a lovely hilltop winery with a view that overlooked the city. You can’t beat Friday morning wine tasting! 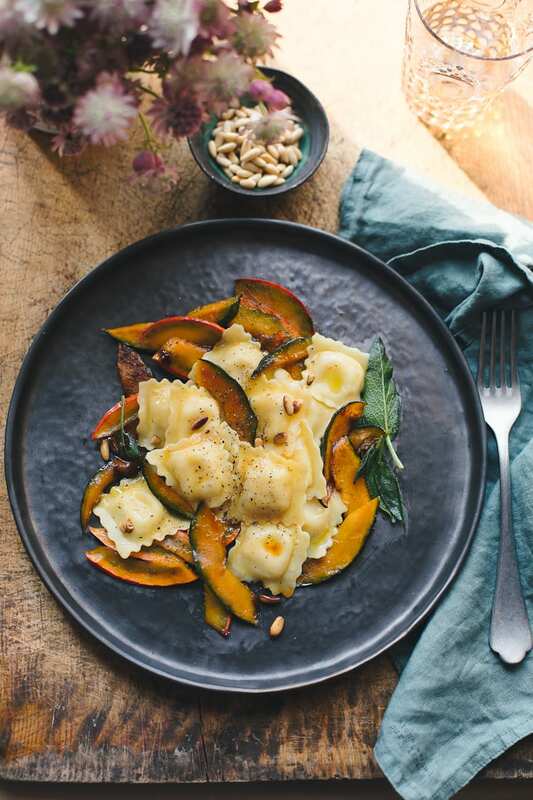 For lunch, we enjoyed a four-course pasta meal featuring Giovanni Rana’s Skillet Gnocchi, Chicken Mozzarella Tortellini and even a special-made chocolate and custard fried ravioli stuffed with warm, molten chocolate for dessert. The food was so good it hurt. The chef came out and explained each dish as though passion was his secret ingredient, which I’m sure it was and I loved that. The regional wines paired with each dish were delicious, too. This was by far my favorite day and the most jam packed! The day began with a tour of the Giovanni Rana pasta factory, fueled by two early morning espressos and a whole-grain croissant spiked with flax seeds (Italy, I love you). We couldn’t bring our cameras inside (I felt like we were walking into the Willy Wonka factory) but all you have to know is this: there’s a reason why it’s the #1 fresh pasta brand in Italy. It’s called quality! Quality is only a product of the people who make it happen, and let me tell you the Rana family makes it happen. You know how I know this? I saw it first-hand with my very own eyes. Their employees have to pass rigorous quality control tests, like smelling and tasting certain ingredients and then having to identify them. And, equally as important they also have to have passion. Period. No passion, no job. PS: it was Saturday when we visited the factory and everyone there was smiling and waving at us! How’s that for some work/life balance? After the tour, we attended a pasta making class (see black and white pics above). I got to work with the freshest baby spinach I’ve ever touched, creamy, pale yellow mascarpone cheese, and the king of all cheeses, Parmigiano Reggiano freshly grated off the wheel itself. You know, before going on this trip I used to think ravioli and tortellini were filled with some kind of dense mystery paste. But because I actually got to see the production process and then make some ravioli for myself, my whole perception of filled pasta changed. I could actually taste the spinach in the ravioli, the filling was light and creamy, and the color of the spinach managed to stay bright green even after it was cooked (because we all know what overcooked spinach looks like…). After the pasta class, we took a trip to the Rana family villa in Lake Garda for a food-styling workshop. IT WAS THE WORKSHOP OF MY DREAMS! So, imagine this: the most gorgeous rooms filled with the perfect light, antique props (separated by color and style!) 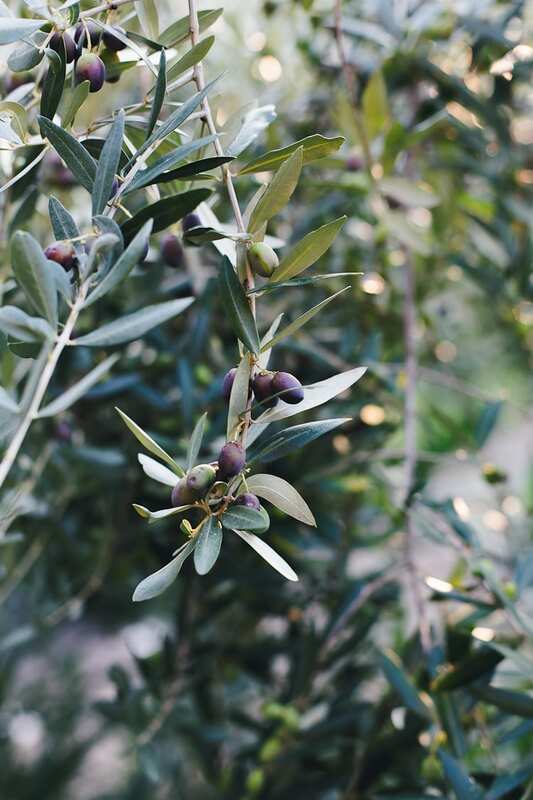 and tables and tables filled with the freshest Italian ingredients your eyes ever did see. 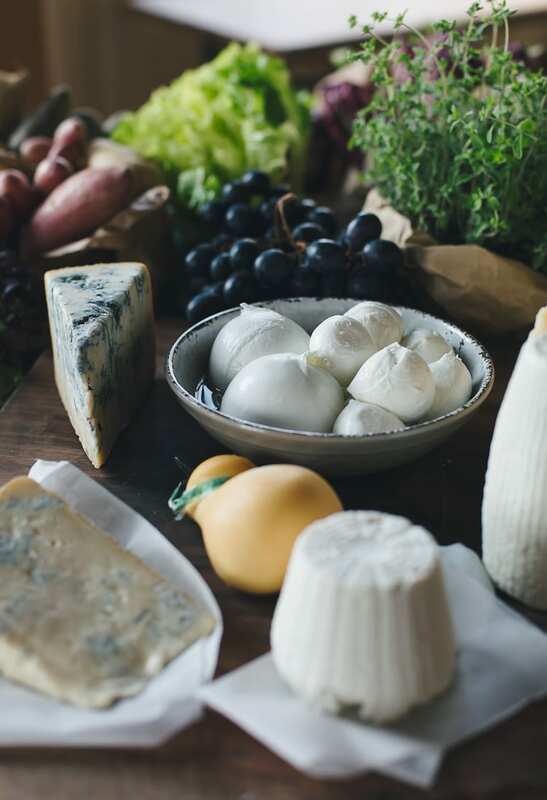 This included assorted Italian cheeses, fresh grapes, all kinds of seafood, chestnuts in their spiny shells, lobster, beautiful autumnal squash, chili peppers, plump figs, the juiciest lemons with their pretty green leaves attached- I cannot even begin to describe the scene to you. I think my heart stopped beating at one point. 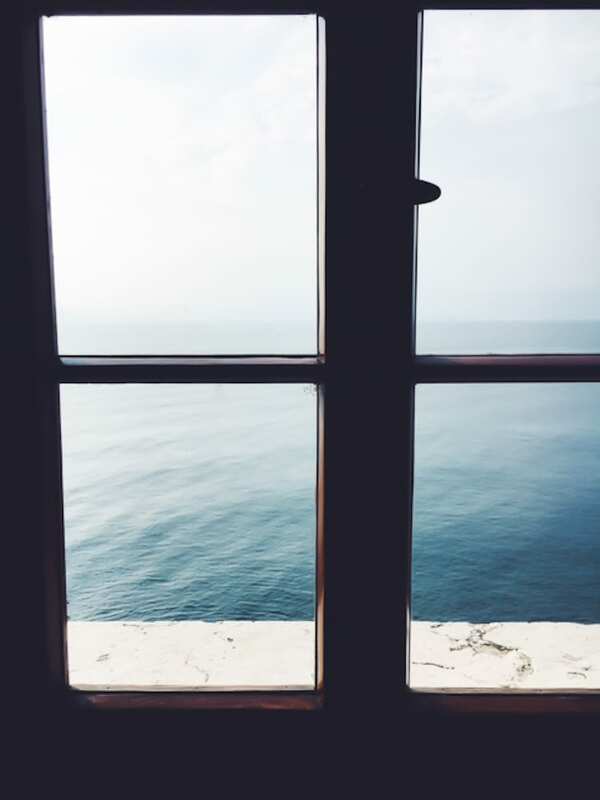 Did I mention we got to gaze out of this stunning window while we worked? This truly was a trip of a lifetime. But before I wrap it all up, I want to tell you about the Rana family story and how their business came to be. Warning: it might make you want to quit your day job in pursuit of cultivating your inner most passion! Mr. Giovanni Rana, who just turned 80 (and also the most adorable man ever besides my Grandpa) got the idea for his business when he was only 13 years old. At the time, he was working with his brother in a bakery. 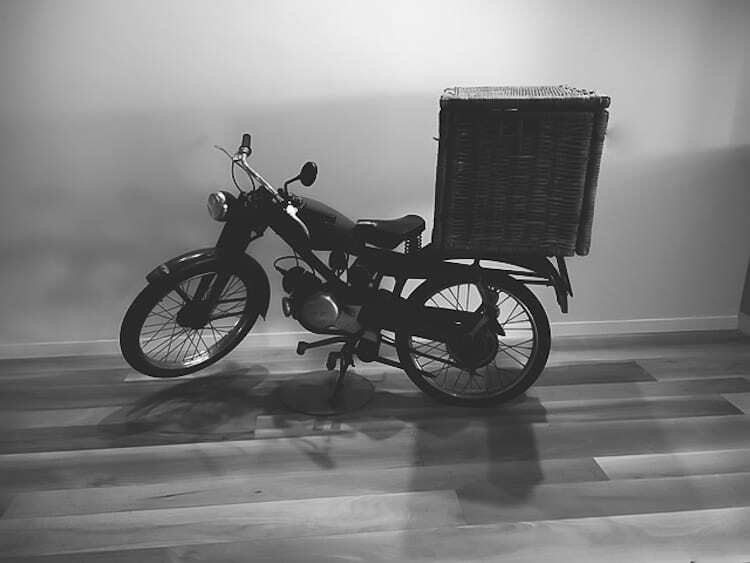 He made the bread dough and then delivered the loaves on his bicycle to the local shops. As he became familiar with the clientele, he also became familiar with an apparent growing need for something else: fresh pasta. You see, this need was developing back in the 50’s when women were entering the workforce and spending less time in the kitchen. And so, for little Giovanni the lightbulb went off. In addition to making bread, he started to make and sell fresh pasta. The concept took off and it was very well received. 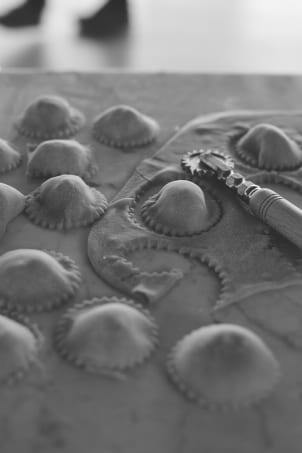 When Mr. Giovanni eventually met his wife, their business expanded into a love story- he continued to make the pasta dough while she made the fillings for the stuffed pastas, like ravioli and tortellini. And the rest is fresh pasta history. Now, Mr. Giovanni’s son Gian Luca (CEO of the company) passionately continues the story and runs the business in Italy, in Europe, and most recently in the U.S. The biggest take away for me on this trip wasn’t necessarily about the pasta. It wasn’t about the Giovanni Rana fame and fortune. In fact, if there was an ego lurking in the room I couldn’t find it. For me, it was all about love. A love for ingredients, a love for quality, a love for people who are driven by passion, pride, culture, and most of all (if not the greatest of all) a love for family. 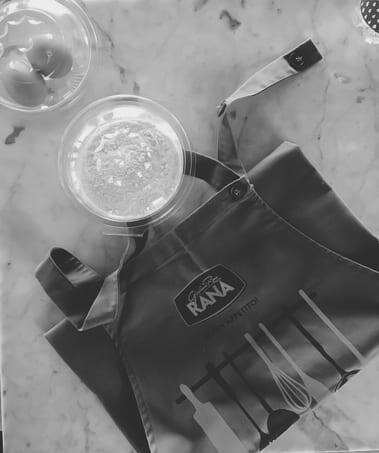 It’s evident that love has defined the Rana success story because it encompasses a product so unique you can not only taste it, but it’s one that you can actually feel. I certainly felt it. And when you feel something you can’t help but want to share, right? 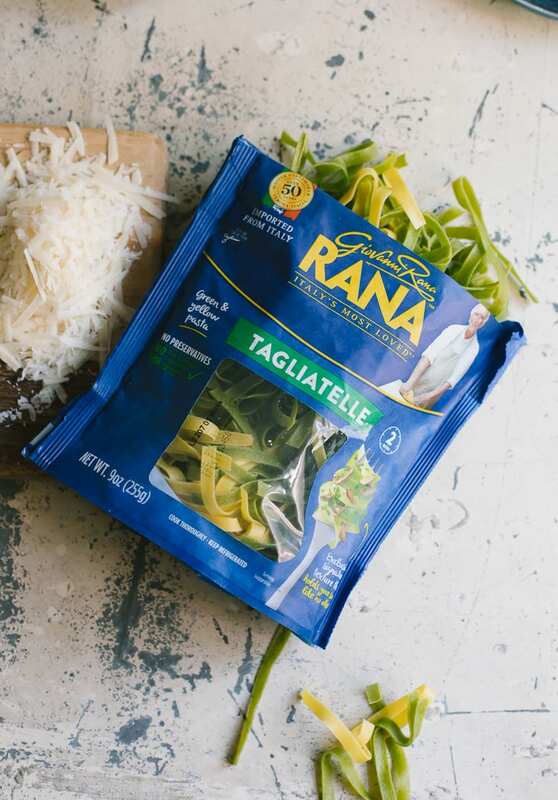 Even when I came home to New York and I told my friends and family all about my trip, they would send me pictures of themselves in the grocery store holding up a package of Giovanni Rana ravioli with big smiles! What I’ve gained from this experience is that whether it’s a new recipe, a relationship, or even a strand of fresh tagliatelle simmering in a pan of simple tomato sauce- with just a little bit of love (and serendipity!) everything grows. 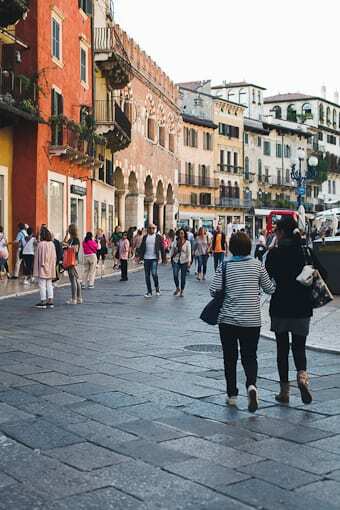 The Italians might be famous for pasta, but they’re also famous for the art of restraint. Specifically, I’m referring to how they respect their ingredients. You won’t find big old bowls of penne drowning in meat sauce… just a little bit of pasta with a spoonful of sauce is how they do it. When I visited the pasta factory, one of my most memorable moments was sampling a chunk (or two!) of fresh Pecorino Romano cheese right off the wheel. It was nutty and only lightly salty- I’m actually salivating as I type this. So, I took a nod from the Italians and created a dish that’s all about the pasta. It only takes 10 minutes to prepare. 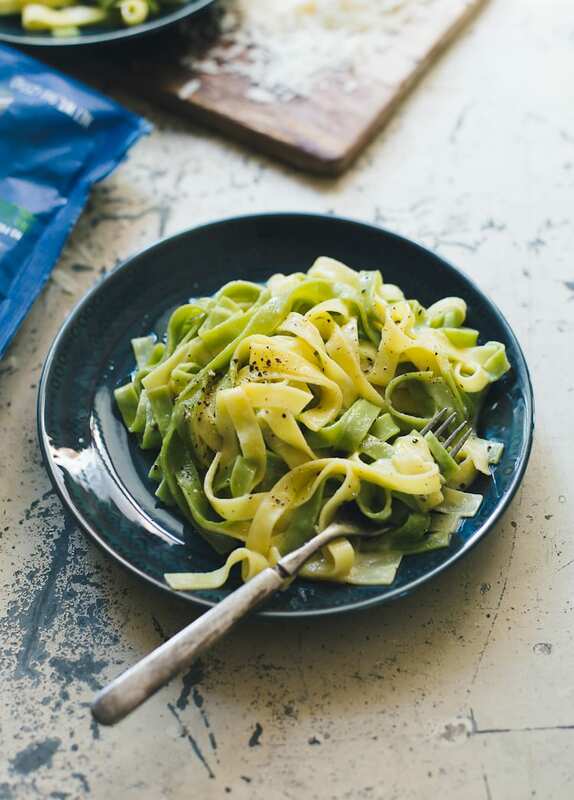 Plus, as an added bonus, Giovanni Rana Tagliatelle includes egg in their recipe which makes this dish more nutritionally substantial than if using dried pasta. It’s perfect for an easy meal any night of the week. PS: My serendipitous trip to Italy was proudly sponsored by the passionate Giovanni Rana family. As always, I’m happy to write, share, and cook with the products I love. Thank you for your continued support. As a special gift, we’re offering a special coupon code to purchase anyone of these delicious pastas! Click here and enter: MNTWGPN86T. In a medium pot, bring 2½ quarts of water to a boil. Cook the pasta for only 2 minutes. Reserve ½ cup of the starchy cooking liquid and then drain the pasta in a colander. Meanwhile, melt the butter in a large sauce pan over low heat. Add ¼ cup of the reserved starchy pasta liquid and whisk well to combine. Add the pasta to the pan and toss with tongs to coat all of the strands. Add a splash more of the reserved cooking liquid if the sauce seems too dry. Sprinkle with some of the cheese. Finish with black pepper to taste, and serve right away. 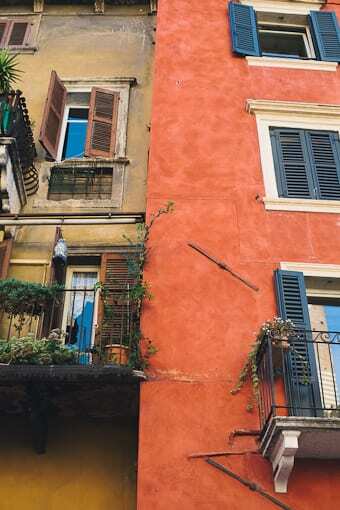 The pictures are gorgeous and this reminded me of my trip to Italy where we stayed in a tiny village in Northern Italy, Uggiate near the Switzerland border. Being American we eat pasta as the main dish. So our first night with the family we stayed with, the first course was pasta. Well we ate seconds because it was so wonderful….then came another course, and another course….I think they must of thought we were gluttons. No one explained to us beforehand about the different courses. Needless to say we learned our lesson. 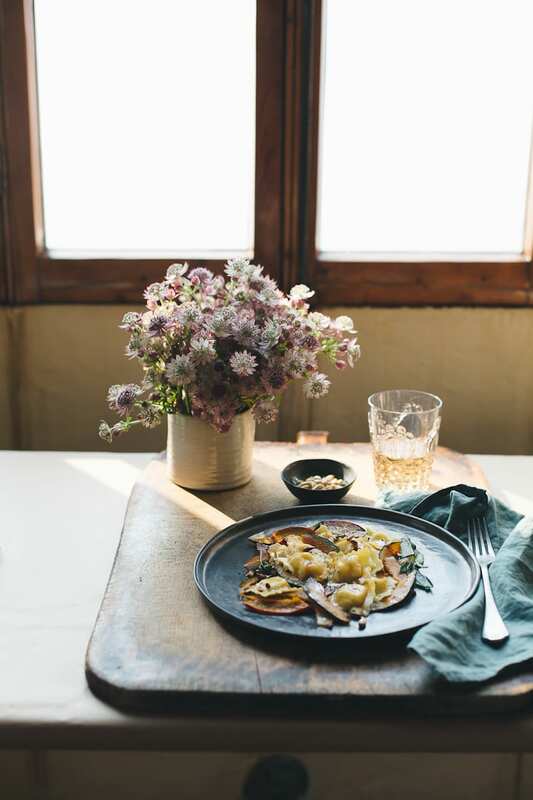 I was astounded at the preparation and time…at that time Nona was still alive so together mother and daughter would fix in my mind these gourmet meals but to them it was standard fare. Oh gosh, Emilie. Can there be a better surprise? Your photos transport me right back to this magical country that seems to weave it’s magical spell around everyone who visits. One cannot but fall in love with the food, people and culture. Love the simplicity and honesty of the food. I think this is my most favorite post of yours ever! 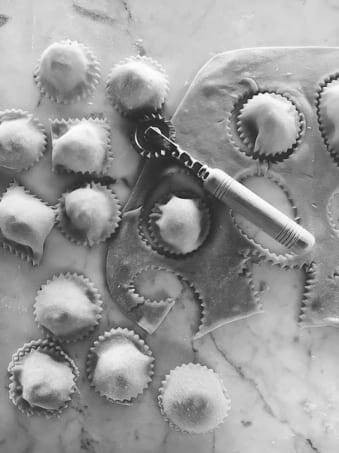 Your descriptions and photos made me feel like I was there with you, and the recipe you posted at the end was my most favorite way to eat pasta as a child and still as an adult. Sometimes simple is best. It is definitely comfort food, and I need to make this again soon. I’ve already gone to the Giovanni Rana web site to find where to buy their products in my area. 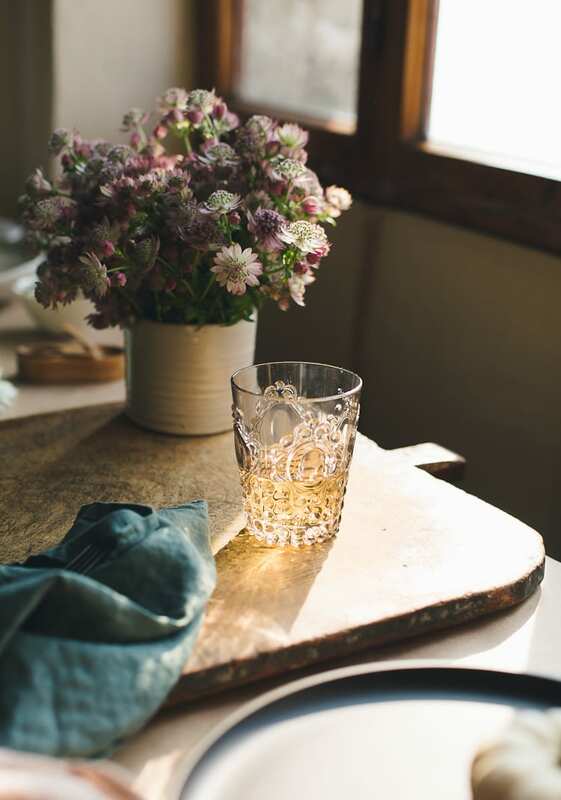 Thank you for a wonderful post and product rec. what an amazing experience… this A ussie is so envious… your sourdough book just arrived and am devouring it in stages to make the experience last longer…. thanks for the photos in your posts too..
Hi Rhonda! Thank you so much :) The first dish was fresh tagliatelle pasta (so good! 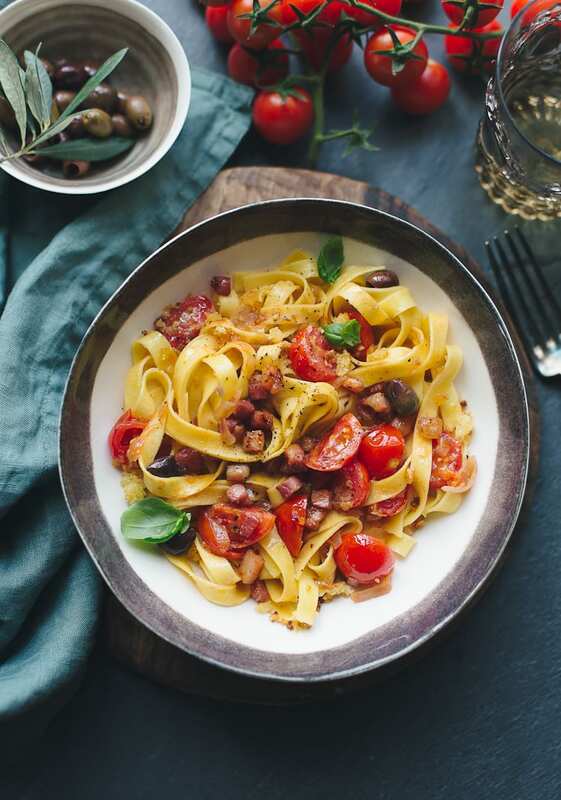 ), with sautéed tomatoes, pancetta, olives, basil… and I think some garlic and chili flakes (my memory is a little fuzzy!). To finish, it was topped off with crisped breadcrumbs that were lightly fried in olive oil. Enjoy!